Founded around 1700 by a group of German Lutherans known as Pietists, the Halle Orphanage became the institutional headquarters of a universal seminar that still stands largely intact today. It was the base of an educational, charitable, and scientific community and consisted of an elite school for the sons of noblemen; schools for the sons of artisans, soldiers, and preachers; a hospital; an apothecary; a bookshop; a botanical garden; and a cabinet of curiosity containing architectural models, naturalia, and scientific instruments. Yet, its reputation as a Pietist enclave inhabited largely by young people has prevented the organization from being taken seriously as a kind of scientific academy—even though, Kelly Joan Whitmer shows, this is precisely what it was. The Halle Orphanage as Scientific Community calls into question a long-standing tendency to view German Pietists as anti-science and anti-Enlightenment, arguing that these tendencies have drawn attention away from what was actually going on inside the orphanage. Whitmer shows how the orphanage’s identity as a scientific community hinged on its promotion of philosophical eclecticism as a tool for assimilating perspectives and observations and working to perfect one’s abilities to observe methodically. Because of the link between eclecticism and observation, Whitmer reveals, those teaching and training in Halle’s Orphanage contributed to the transformation of scientific observation and its related activities in this period. "By underscoring the virtues of eclecticism and its Pietist roots, Whitmer has taken discussion of the early relationship between science and religion to a new level. . . . Via meticulous scholarship and fabulous illustrations, she explores, with nuance, how religious and intellectual energies intertwined in ways that galvanized mathematical practice. By highlighting the interplay among individual beliefs, actions, and scientific achievements, her book resuscitates the careers of such understudied figures as Francke, Wolff, and Leibniz in history of science scholarship. Readers curious about the evolution of scientific culture should cherish this book’s revelatory spotlight on an important niche in the Enlightenment." "Whitmer's new book offers a history of science set in the Halle Orphanage, a building that was founded in the middle of the 1690s in the Prussian city of Halle by a group of German Lutherans known as Pietists. . . . As the fascinating story unfolds, Whitmer's account meaningfully contributes to histories of observation, material culture, models and modeling, and education." "Modernism takes many forms; what many of us thought was a credit to Pietism of the Franke school turns out to be an amalgam of differentiated Enlightenment thought. I strongly recommend reading this book and rethinking the issues." "Whitmer approaches Halle's orphanage as a scientific institution, placing it at the center of the early German Enlightenment. In doing so, she tells a vital and largely neglected story that fundamentally challenges common notions about the divide between the scientific and the sacred in the early modern era. This is a fascinating book with unexpected implications for the present." 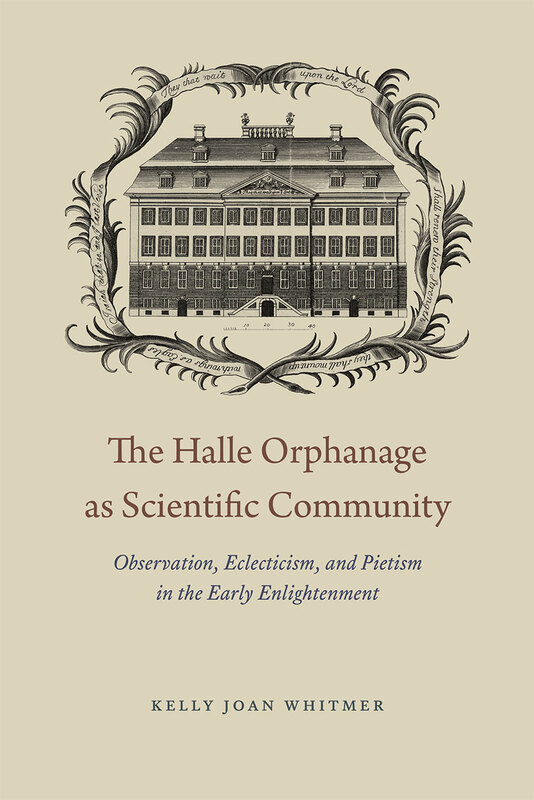 "In this lucid and engaging book, Kelly Joan Whitmer describes the Halle Orphanage (das hallesche Waisenhaus)--an orphanage founded around 1700 by German Lutheran Pietists in the Prussian city of Halle--as a path-breaking scientific institution. . . . Coursing through The Halle Orphanage as Scientific Community is a concern with the epistemic ideals and persona of a good observer. . . . One of the strengths of Whitmer's book is the contention that the orphanage was not simply 'structured by logic or reason,' or, at least, that it distinguished itself from other scientific communities by taking seriously the role of affect, desire, and emotion in the pursuit of scientific knowledge."